CathNews - Can you find God in a black hole? Can you find God in a black hole? Thanks to the image released by the Event Horizon Telescope consortium on Wednesday for the first time we have proof black holes exist, writes Fr Guy Consolmagno SJ. Source: America Magazine. We now know a black hole is more than a theoretical construct. It’s a “thing”. So if St Ignatius was right to inspire us to “find God in all things,” the black hole certainly qualifies. A more fascinating spiritual analogy, however, may be to recognise that a black hole is a perfect example of something we’ve believed in even though we cannot see it or touch it. 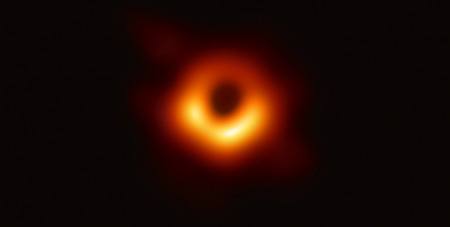 Even the new image released by the Event Horizon Telescope doesn’t show the black hole itself. It shows the shadow of the black hole, where powerful electromagnetic radiation, emitted by hot plasma swirling ever more energetically around something big and massive at the centre of the M87 galaxy, suddenly has had that radiation cut to zero at a discrete boundary. And that boundary corresponds exactly to where our black hole theory suggested light would suddenly no longer escape. That boundary, theoretical up to now, had been dubbed the “event horizon” (hence the name of the “telescope” — actually a collection of radio telescopes spread across the globe) since any event that occurred inside that boundary would be as cut off from our vision as the way the setting sun disappears when it drops below our own horizon. The source of that event horizon, like the sun gone down, is certainly there; but its light is forever trapped by its gravity. We don’t see the black hole, we see its shadow. This is just the first of what is hoped to be many such images of many such black holes. For now, it is enough to marvel at that stark shadow in the ring of fire imaged by the Event Horizon Telescope. Black holes are real. Exotic, strange, unexpected, well outside of our mundane experience; and yet as real as the dirt under our feet, and fundamental to how our own galaxy (and our own solar system) was made possible. Yeah, I think you can find God there. – Fr Guy Consolmagno SJ is director of the Vatican Observatory.